Hurricane Florence caused widespread flooding across the Carolinas. As the storm moved inland, from September 15 to 17, heavy rain caused widespread inland flooding, inundating cities such as Fayetteville, Smithfield, Lumberton, Durham, and Chapel Hill, as major rivers such as the Neuse River, Eno River, Cape Fear River, and Lumber River all spilled over their banks. Most major roads and highways in the area experienced some flooding, with large stretches of I-40, I-95, and US Route 70 remaining impassable for days after the storm had passed. The city of Wilmington was cut off entirely from the rest of the mainland by floodwaters. The storm also spawned tornadoes in several places along its path. Many places received record-breaking rainfall, with more than 30 inches (760 mm) measured in some locations. At least 45 deaths were attributed to the storm, and damage is currently estimated at more than $38 billion (2018 USD). Hurricane Florence is gone but her devastating effects continue in the Carolinas where dangerous flooding is still occurring, forcing more people to leave their homes. 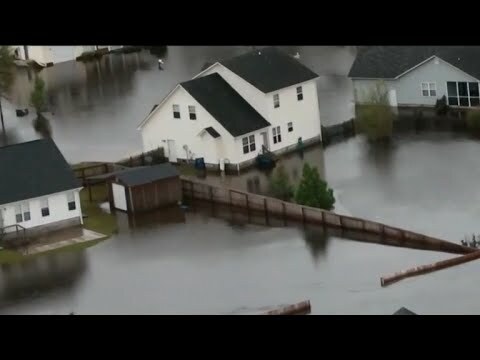 The storm poured an estimated 10 trillion gallons of water across the Carolinas and it could be weeks before the flooding ends. Thousands of American Red Cross disaster workers are on the ground, providing food, shelter, relief supplies and other services. Sunday night, almost 2,500 people stayed in 39 Red Cross and community shelters in the Carolinas. This included approximately 2,280 people in 28 shelters in North Carolina; more than 200 people in 11 shelters in South Carolina. In total, the Red Cross and other organizations have provided more than 107,800 overnight stays in emergency shelters across the Carolinas. The Red Cross has provided about 91 percent of these stays. Today, more than 3,300 Red Cross disaster workers from all over the country are helping to shelter, feed and support people affected. Working with partners, the Red Cross has served more than 563,000 meals and snacks. Volunteers from partner organizations are cooking hot meals at 15 kitchens. These meals are being served at shelters or from more than 100 Red Cross food trucks circulating through affected neighborhoods. The Red Cross also distributed more than 45,000 relief items like diapers and comfort kits that contain deodorant, toothbrushes, toothpaste and other hygiene items for people forced from their homes. Volunteer mental health and health services professionals have provided some 21,400 contacts to provide support and care to evacuees. Since September 11, more than 5 million weather alerts have been sent through Red Cross apps to help people make lifesaving decisions. Hundreds of roads are still impassable, making it difficult to deliver much needed assistance. In North Carolina, some rivers are going down but won’t be out of flood stage until later this week. In South Carolina, there is a renewed threat of flooding as waters head south. It’s anticipated people in multiple communities will have to evacuate over the next few days. The Red Cross has additional shelters ready as more record breaking flooding occurs along multiple rivers in the region.